There are so many things about Hebrew that are absolutely amazing. No wonder it is God’s language of choice! You may have heard that no detail in scripture is arbitrary or insignificant. Well, numbers are definitely no exception. Through them, and other things, the Holy Spirit tells us the incomparable story of Jesus. Through His Jewish secretaries, He repeats it over and over again, pointing out wonderful truths in order to teach, encourage, and bless us! One of the most unique things about Hebrew is that they don’t use numbers like we do here in the West. They use the letters of their alphabet. It is a language of picture writing, like Chinese. Each letter has a numerical value, a picture associated with it as well as a color, and a musical note. King David, who wrote most of the psalm, played them on his harp. His instrument had 22 strings, the same as the number of letters in their alphabet. He could literally play the music of the Psalms by following the Hebrew letters of each one! All of these things lend to greater meaning and deeper understanding of whatever text you are reading or studying. 2: The Number Of Witness. Whenever you see the number 2 mentioned, it is referring to the fact that there is a witness to a particular truth or message. #1. 2 people were present in the garden to witness to the failure of man to obey God. #2. 2 disciples walked along the Emmaus Road and were witnesses to what Jesus expounded, showing Himself to them as written in the scriptures. #3. There are 2 major Covenants that testify, or bear witness, of God: The first to His judgments, the second to His Grace. #4. Deuteronomy 17 states that anyone deserving of death shall be put to death on the testimony of 2 or 3, but at the very least, 2 witnesses. 3: The Number of Manifestation. #1. Jesus rose (was manifested) from the dead on the 3rd day. #2. On the 3rd day, God commanded dry land to appear (manifest) out of the waters; a picture of resurrection. #3. On the 3rd day God will raise us up (manifestation of the sons of God) that we may live in His sight, according to Hosea. This speaks of the “harpadzó,” or snatching away of the Church, which most know as the rapture. Throughout the Bible, there are many occurrences of the number 3. But it’s not merely the actual number itself. It could be some event or anything that is mentioned 3 times. This applies to all other numbers as well. God does a lot of things in three’s: We have a Triune God: One God, three persons. Time is divided into past, present, and future. Man, whom He created, tri-parteid: Body, soul, and spirit. There are 3 states of matter: Solid, liquid, and gas…..well, you get the idea. 5: The Number of Grace. #3. The 5th time Noah’s name is mentioned it says of him, “But Noah found grace in the eyes of the Lord.” Genesis 6:8. This is the first time grace is mentioned in the Bible; right here in this verse. Noah’s name means “Rest;” so literally, “Rest found grace!” The best way to receive God’s grace is when we’re “resting” in the finished work. 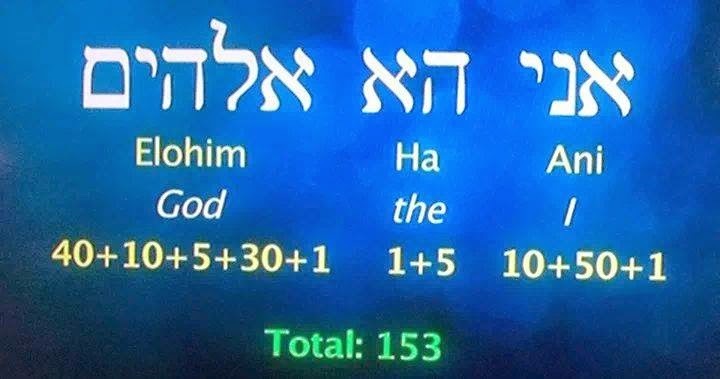 As you can see in the picture above of the Hebrew alphabet, Hei [ה], the number circled in red, is the 5th letter as well as the number “Five.” That’s why we say, “Five is the NUMBER of GRACE! 17: The Number of VICTORY. This next number, “17,” is really exciting! “Who shall separate us from the love of Christ?” He (Paul) by the Holy Spirit, goes on to mention 17 things that cannot separate us from God’s love. #2. Joseph was 17 years old when he was sold into slavery. His whole story started on a victorious note in God’s eyes! #3. 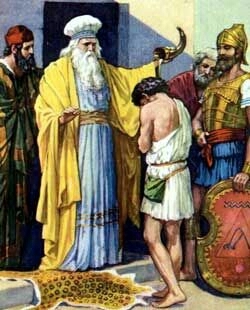 Davids slew Goliath when he was 17 years old. # 4. Jesus rose from the dead on the 17th day of the month of Nissan. #5. On the day of Pentecost when the disciples were baptized in the Holy Spirit, they spoke with other tongues. They are listed in the text. Care to guess how many? Yep; 17! SEVENTEEN DIFFERENT LANGUAGES! This next one is really, REALLY COOL! There were so many fish, THEY HAD TO DRAG THE NET TO SHORE! 11 “Simon Peter went up and dragged the net to land, full of large fish, one hundred and fifty-three;” Let’s do a little math, shall we? You saw in the opening passage the story of the great catch of fish. 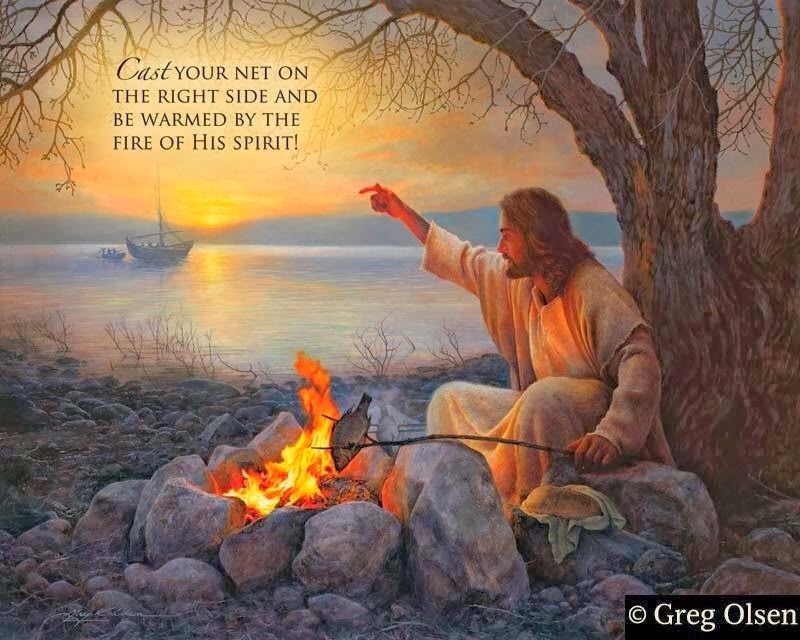 It is no accident that the Holy Spirit made mention of the number of fish they caught. Whenever He does that, pay close attention: He has something to tell us that will really bless and encourage. It is just further proof that NOTHING in the Bible is recorded arbitrarily, just to make the book thicker. Let’s see what happens when you add the numbers together from 1-17! Why God Changed the Jewish Calendar. But the best, I have saved for last! You recall that the ark rested on Mt. Ararat, I’m sure. It settled there on the 17th day of the 7th month. 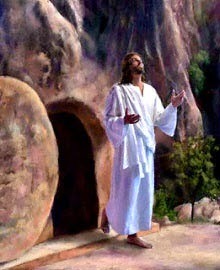 Jesus rose from the dead on the 17th day of the first month, which, believe it or not, is the exact same day! You see, In Moses’ time, God changed the Hebrew calendar. He told him that the 7th month, Nissan, would now become the first month of the year to the Israelites. Remember, this is the time of year in which Passover was instituted. He was pointing us to His beloved Son. “Arar” in Hebrew, means “curse.” “Ararat” means “the curse is reversed! AWESOME GOD, AWESOME SAVIOR! THANK YOU, JESUS!!! Oh yeah…….there are wonderful secrets in Bible numbers! !